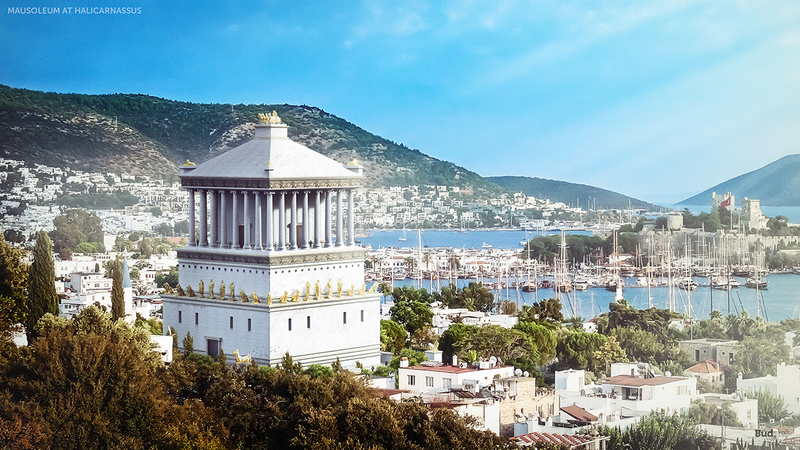 The 7 Wonders of the Ancient World was a list of must-see sites for Ancient Greek tourists. Compiled by Antipater of Sidon, a poet in 2nd-century-BCE Greece, with later contributions by figures such as the mathematician Philon of Byzantium, the list remains an important piece of intangible heritage today. 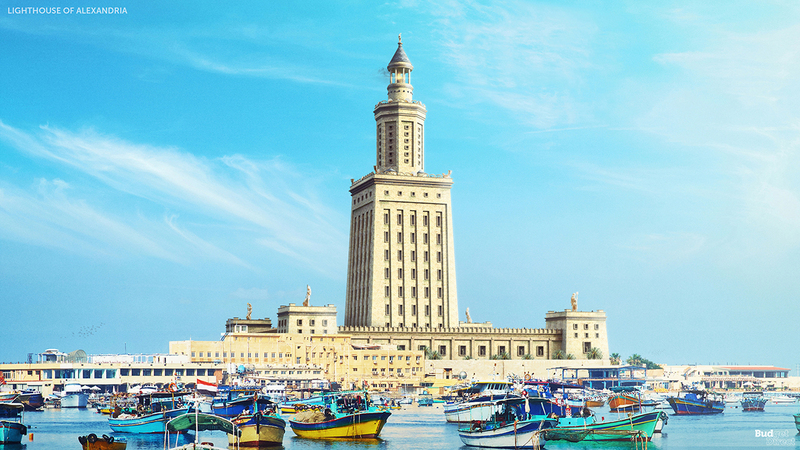 Sadly, only six of those ancient wonders are still standing. So, we decided to give modern culture-lovers the chance to visit the structures that Antipader first recommended. 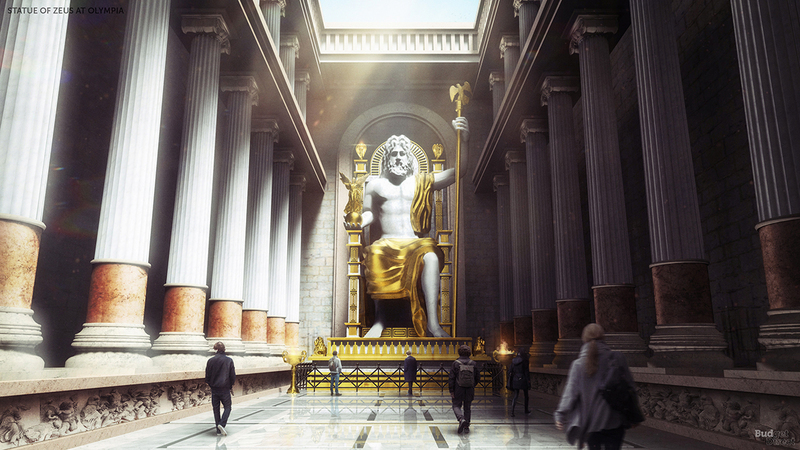 In this new series of renders we’ve reconstructed the 7 Wonders of the Ancient World, so you can see how the ruins originally looked. Got your ticket? 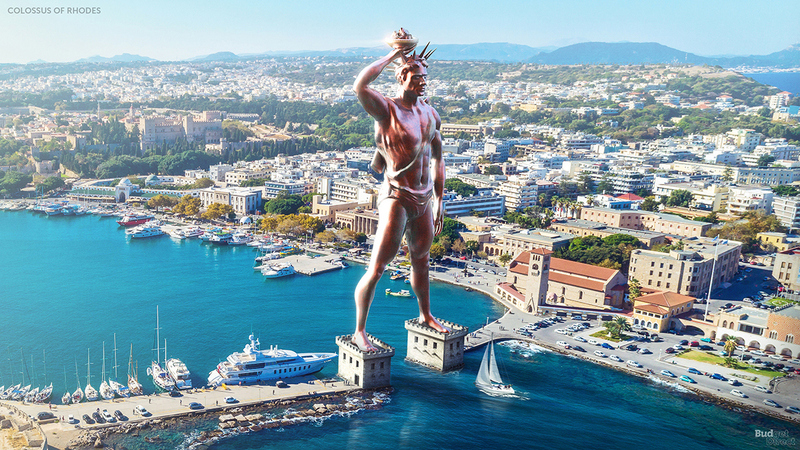 The 108ft Colossus stood astride Mandraki Harbor, its feet firmly planted on 49ft pedestals so that boats could pass between its legs. It was certainly one way to let outsiders know who was boss: in fact, this giant statue of the sun god Helios was sculpted from the melted-down weapons and shields of the Cypriot army, whom Rhodes had recently vanquished. The Colossus itself was toppled by an earthquake just half a century later. It remained in recline for visitors to wonder at for a further 800 years, until Muslim caliph Muawiyah I melted the statue down and sold it for scrap. Built over 4,500 years ago from stones weighing 2.5 to 15 tons each, the Great Pyramid remained the world’s tallest man made structure for nearly four thousand years. Nearby excavations have revealed it’s likely that up to 100,000 skilled and well-fed workers came from all over the country to live in a temporary city as they built the otherworldly pyramids of this region. 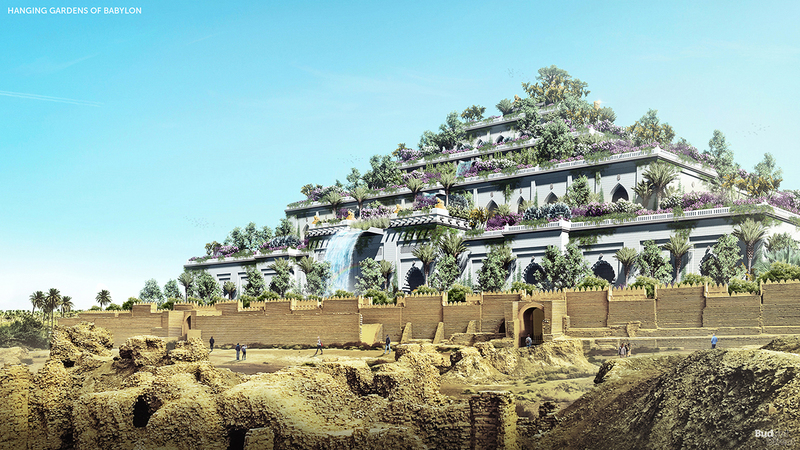 Did the Hanging Gardens ever actually exist? They’re the only wonder on the list that may have been a figment of an ancient travel writer’s imagination. The native writers of Babylon – which was 50 miles south of what is now Baghdad in Iraq – made no mention of the garden. But if it did exist, it seems to have been a remarkable engineering feat, with complex machinery drawing water to built terraces up to 65ft high. The lighthouse by which all subsequent lighthouses would be judged, this structure by Sostratus of Cnidus featured a burning fire atop a cylindrical tower, atop an octagonal middle, atop a square base. A spiral staircase led to the business-end, where there may also have been a statue of Helios. The building fell into disrepair sometime between the 12th century and late 15th century, when Mamlūk sultan Qāʾit Bāy built a fort on the lighthouse’s ruins. The tomb built for Mausolus, ruler of Caria, an ancient region of Asia Minor, was so impressive that the late king’s name became the generic word for large funeral monuments. Mausolus commissioned many great temples and civic buildings in his life, and planned the Mausoleum himself. The structure was a mixture of Greek, Near Eastern, and Egyptian design principles set in Anatolian and Pentelic marble. When the tomb was excavated, sacrificial remains of oxen, sheep, and birds were taken to be the leftovers of a ‘send-off’ feast for the Mausoleum’s permanent tenant. This 40ft gold and ivory-plated statue was erected at the Temple of Zeus by the Eleans in an attempt to outshine the Athenians. Unfortunately, the framework and throne were made of wood. Although it seems to have lasted a few hundred years, the statue likely perished either when the temple was destroyed in 426CE or a few years later in a fire at Constantinople. 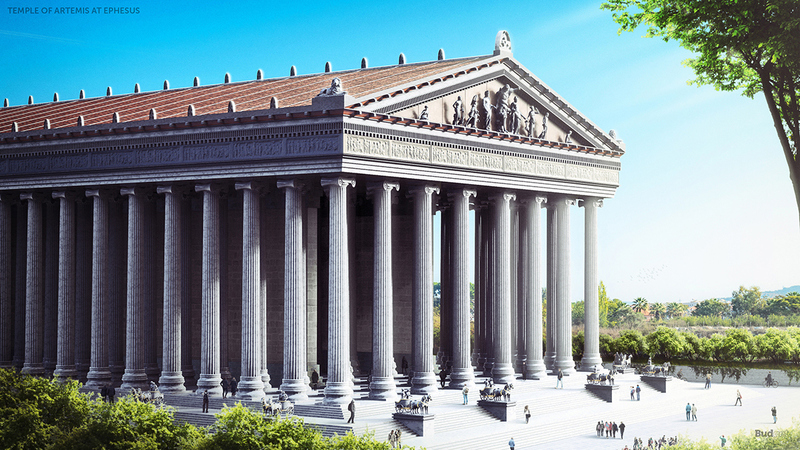 Ancient Greeks, 3rd century Goths, and early Christians alike seem to have been provoked by this enormous temple to the Greek goddess of chastity, hunting, wild animals, forests, and fertility: the building was built and destroyed three times. The first to demolish it was Herostratus, who burned it down just to get famous. Next came the Goths, who wrecked the city while passing through on the run from the Romans. Finally, a Christian mob tore it apart in 401 CE, leaving just the foundations and a single column – which can still be seen today. The original wonders of the world were chosen not just for their beauty, but for the ambition, enterprise, and engineering that went into their creation. Which modern buildings would make your list of the new wonders of the world? So how were these reconstructions created? Gathering enough reliable information on each wonder is where the whole journey starts. Our researchers set about finding extensive visual and written information on each wonder; including when it was built, which civilization built it and for what purpose. They gathered information around the specific features of each wonder; such as materials, measurements and any other important architectural features. These details were then backed up with hi-resolution images of drawings, renders or any other available imagery to provide a strong idea of what the wonder looked like when it was built. Once this research was compiled, it was passed along to design duo Keremcan Kirilmaz and Erdem Batirbek. Keremcan’s background is in architecture while Erdem works as a product designer; the perfect combination for such a project as this. Upon receiving the brief and research they began to extract as much information about each wonder as possible. They looked closely at locations, dimensions, plans, statues, ornamentations, patterns, textures, colors, materials and finish. Since specific details couldn’t always be confirmed, they based their images on the depictions and descriptions that they came across more frequently or the ones that they found most impressive. Next they searched for the background images. Finding well lit images of the original locations with enough space for the structures to be inserted into proved to be challenging, but the duo succeeded. Next, they worked out where each one would stand using satellite images, alongside the information acquired in the research phase. With all this prep work done, the duo could begin modeling the wonders. Once they were happy with the 3D renders, they had to be inserted into the corresponding background image. Matching a 3D rendering to a background image requires a trial-and-error approach. The duo were able to control almost every aspect of the final images; from colors and textures to lighting and blocking. The next stage was to add atmospheric effects, lens effects, vehicles, people and foliage to give the images that ‘real life’ look. The duo then submitted all of the Photoshop files to our motion graphics artist Fractal Motion, who was in charge of creating the animations. For the uninitiated, this time-consuming and complex process involves dividing up the images, then animating them using a tool in Cinema 4D software called Polyfx before refining it all in After Effects. Jordan, P (2014). 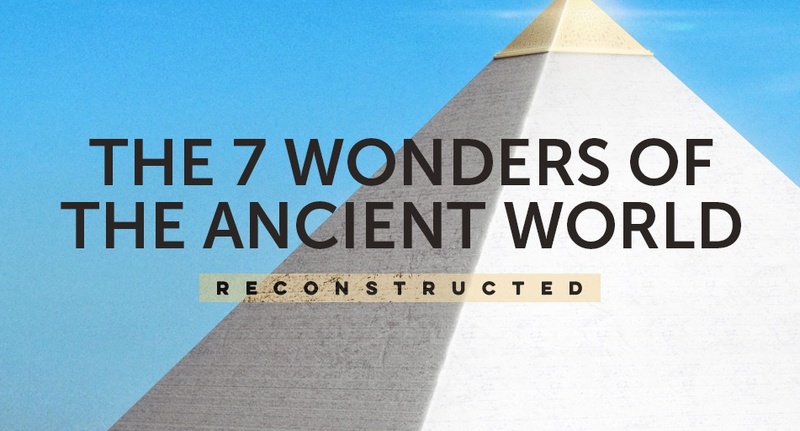 Seven Wonders of the Ancient World. Routledge. pp. 21–149. ISBN 978-1317868859. Romer, J (2007). 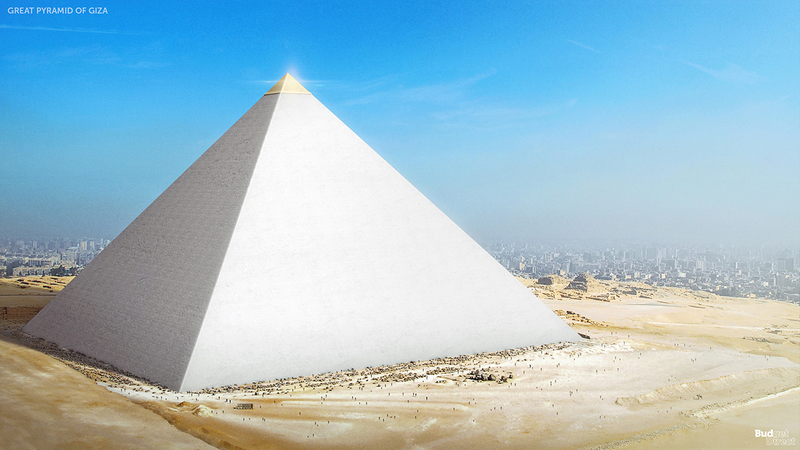 The Great Pyramid: Ancient Egypt Revisited. Cambridge University Press, Cambridge. ISBN 978-0521871662.